STRATFORD, CT (December 21, 2018) — For most adults, the reality of managing day-to-day expenses can be a challenge. For high school students, this “reality” is not far away. A few weeks ago, students at Ansonia High School recently took a glimpse into their future by attending a Financial Reality Fair. 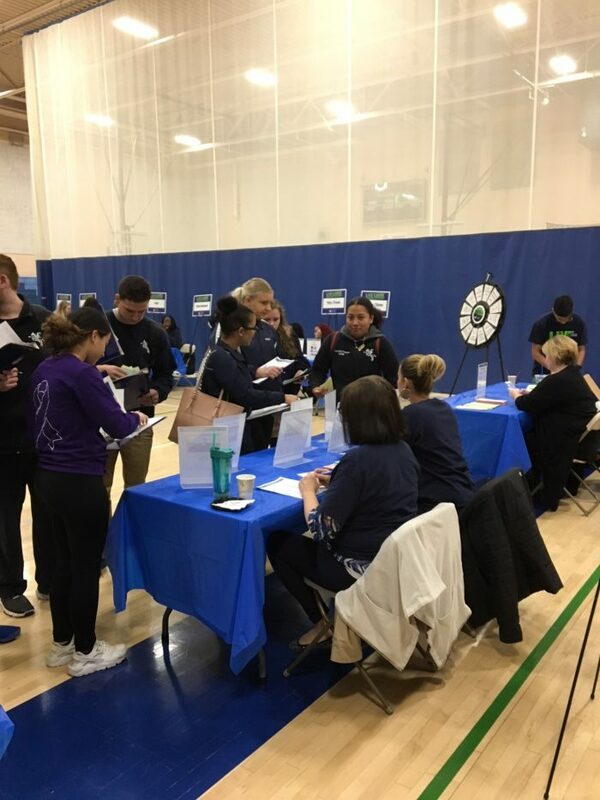 The Financial Reality Fair is sponsored by Sikorsky Credit Union, a financial institution that has taken a leadership role in promoting financial literacy to high school students. For the past ten years, Sikorsky Credit Union has sponsored Reality Fairs for students, including the past five years at Ansonia High School. The Financial Reality Fair gives students the opportunity to experience “real-life” finances based on their chosen profession. Students visit expense tables to spend their “hard earned money” on real-life choices, such as housing, transportation, food, and utilities. They are tempted along the way with nonessential expenses including pet ownership, electronics, concert tickets and vacations. Additionally, students step up to spin the “Wheel of Reality,” which increases or decreases their cash flow and simulates unexpected events and expenses that occur in day-to-day life. After students visit all of the expense tables, they balance their budgets to see if they made the right choices to successfully live on their own. Students then meet with volunteer financial counselors who show how well they managed their budget. In the end, students walk away with an awareness of the financial challenges they will face and the experience of maintaining a lifestyle based on a budget. In the spring, the Credit Union will host five additional Financial Reality fairs at Bunnell High School in Stratford, Henry Abbott Tech in Danbury, Seymour High School, Shelton High School and Stratford High School. Sikorsky Credit Union was founded in 1948 and is open to everyone who lives, works, or worships in Fairfield, Hartford, or New Haven counties, with 10 branches located in Bridgeport, Brookfield, Danbury, Milford, Seymour, Shelton, Stratford, and Trumbull. Bank with Sikorsky Credit Union in person, online, or on the go with our mobile banking app. Deposits are insured by the National Credit Union Administration, an agency of the U.S. Government.For more information, please visit our website www.sikorskycu.org.